Have you ever had a bad hair day where the static electricity in your hair is uncontrollable? Well, I was lucky to try Static Schmatic that saved the day. Here’s a little bit about this new product . Static Schmatic® was created by the mother/daughter team, Kris and Whitney, who live in the picturesque mountains of Aspen, Colorado. It was a particularly cold winter, and we were entangled with static – on our hair, clothes and kids. There weren’t any products we would spray on ourselves, let alone my children (Kris’ grandchildren), so we got to work! We wanted a solution that was all natural, safe for the environment, odor-free and stylish so we teamed up with a natural chemist who created just that. Each product is different, but they all contain natural ingredients like aloe vera, salt, and coconut oil to name a few. As soon as we found the right formulations, we brought them to the professionals. Local retailers used Static Schmatic for Clothes in fitting rooms, local salons used Static Schmatic for Hair on their clients and our local animal shelter used Static Schmatic for Pets in the “cat room”. Rave reviews started pouring in. Everyone loved the Static Schmatic line! Turns out, we’re not the only ones who needed a natural solution to taming static, and we’re thrilled to share it with you and yours. Static Schmatic products are made in small batches to ensure freshness, and everything from our bottles to our hand-applied labels to our ingredients comes from the United States of America. Static Schmatic gives you the power to safely battle static in a graceful and stylish way while still breathing the clean air around you. We hope you love it! I do get static in my fur and during my morning bushings mom tried Static Schmatic on my fur and I was amazed how it worked. No more static! With our cold winters here in Wisconsin you really have a big problem with static electricity. My fur flies and sticks to everything. 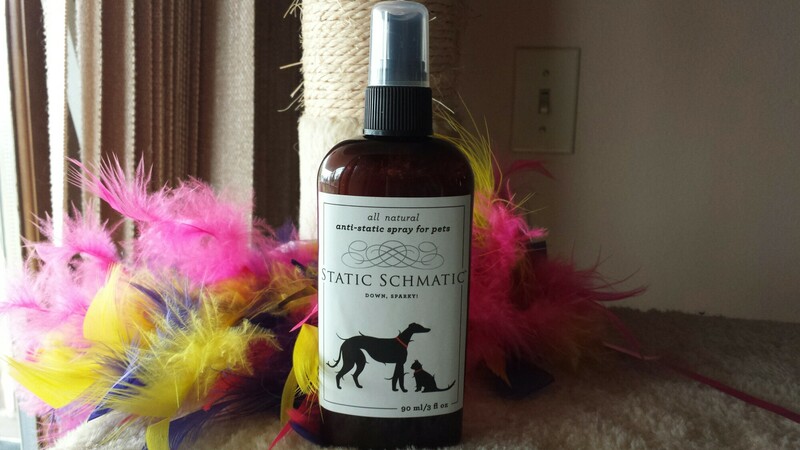 Static Schmatic is all natural so won’t hurt animals and it even smells really good too. Aloe Vera is a succulent plant. Inside the pale green stalks is the flesh and clear gel that are widely known for their healing and soothing properties on skin and hair. An edible oil, which has recently become very popular, coconut oil is growing in the number of benefits and remedies it provides. It’s considered a super-food that has a long list of health and beauty advantages, which include adding moisture, shine and smoothness to hair. The oil is extracted from the white flesh of coconuts and in its purified form, it also has natural antibacterial and antifungal qualities. Vanillin is the key element found in the extract of vanilla beans. It’s an organic compound commonly used to flavor drinks and food. It carries a delicious, sweet scent that gently fades over time. Distilled water is a clean, high quality form of water that has undergone the distillation process to eliminate impurities. Distilled water is not prone to having a mineral build up, which is why we use it in this form. Glycerin is a colorless, odorless liquid that is known for adding moisture to products. It’s a key component in natural hair products because it strengthens hair, adds moisture and elasticity and may even stimulate hair growth. Salt is one of the oldest minerals known for its edible qualities as a seasoning. It’s also used as a colorless, odorless means to preserve fresh ingredients, which is why it plays an important role in Static Schmatic. Static Schmatic has been a lifesaver for me since I have pawarrizzi following me daily and I need to look my best. If you want more information about Static Schmatic I’ll have the links below but before you go in would like to hear from you of what you thought about this new product. Thank you for stopping by see you next week. This entry was posted in Angel's Eyes, Product Reviews and tagged cat, cats, cute, funny, katze, katzen, katzenworld, kawaii, ねこ, ﾈｺ, 猫. Cats At The Bar: Permission? Hhahaha, this post. She could certainly look funny with all fur standing. I just love your tartan out fit and it looks so cosy.x????? What a beauty. She’s totally worth it. Pingback: Static Schematic for Purfection | Jones Way Cleaning LLC.